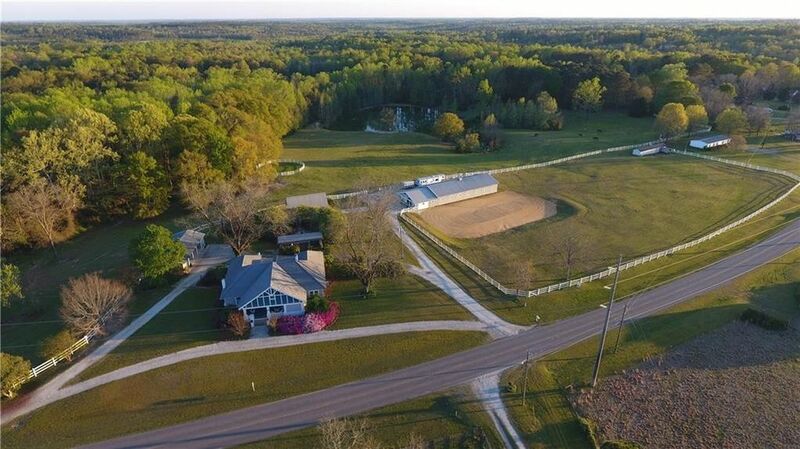 If you're a land lover, this delightful place on 32 acres comes complete with large barn, stocked 3 acre spring-fed pond, guest house and so much more! The stunning 3500 sq ft home is brimming with Southern charm. This 4 BR 3 BA Arts and Crafts classic is beautifully landscaped and includes majestic pecan trees, plum trees and a riot of azaleas. The recently built 588 sq ft guest house is a short walk across the charming gardens from the main house, offers the best view on the property and is complete with kitchen, full bath and bedroom. The 3 bay carport is flanked by a shop and potting shed with additional storage for hay/farm equipment. The master BR boasts two walk in closets and large, dreamy BA. Authentic heart of pine flooring, 6 fireplaces, with gas logs in LR and wood burning insert in FR. All fireplaces are plumbed for ventless inserts. The custom designed kitchen has granite, stainless appliances, double ovens, cook top with historic barn wood hood and walk-in pantry.